So, what does it take to cross the Panama Canal? First, start with planning – interview and hire an agent, fill out a bunch of paperwork, request a Panama Canal Ship ID #, head to Shelter Bay, inspect and admeasure the boat, and get your transit date – 6 March. Then figure out which friends can come help with the line handling. You need 4 line handlers on every boat. 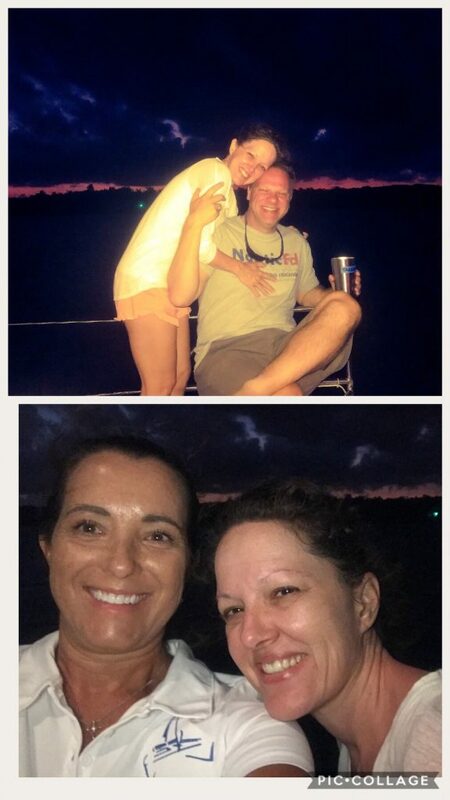 There are a lot of people in Shelter Bay marina who offer to be your line handlers, but this is a once in a lifetime opportunity so we opened it up to our friends. Obviously, it’s just more fun to experience this adventure with people you love. 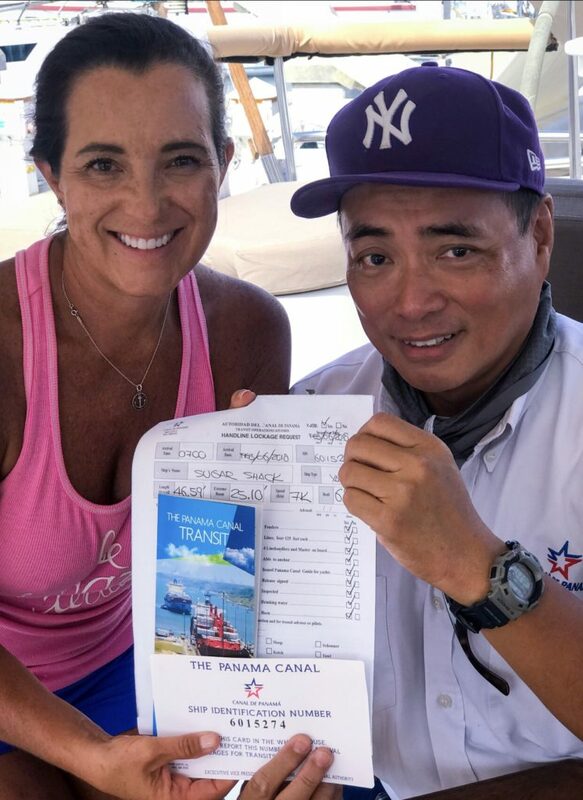 Our agent, Eric Galvez met us on the dock within an hour of our arrival at Shelter Bay and gave us the run down before the Panama Canal inspector came on board. The next day we were measured and inspected and received our Ship ID# and transit date. Successful inspection and ad measure. After we arrived at Shelter Bay for the second time, we received our four “rented” one inch in diameter, stretchy, non high-tech 125′ lines and 8 fenders from our agent. 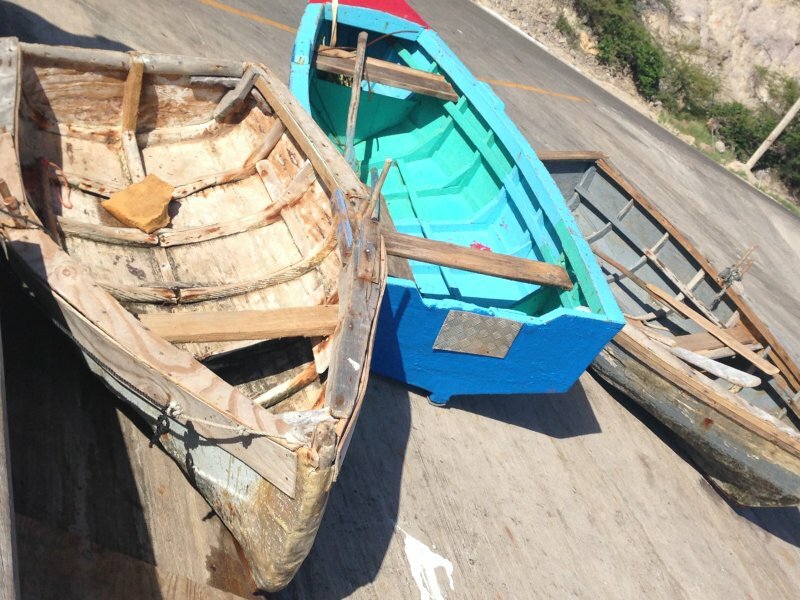 You are required to “rent” these lines and fenders despite what you already have on the boat. We received our transit time of 0500 which was a bit of a surprise as we had hoped to get the 1600 time slot. Oh well, we’re flexible. Since our transit time was a lot earlier than planned, we had to leave the marina a day early. We pulled away from the slip around 1630 on 5 March and headed over to the Flats Anchorage. Not sure why they call it the “flats” as the anchorage is not flat, it is very, very rolly. Matt, Wayne, Heather, Michael and I enjoyed a nice dinner, a little rum and went to bed around 2000 so we would be well rested. Our 0430 wake-up call came fast, but we were excited to get our day started. The pilot boat showed up and Francisco our advisor jumped aboard. 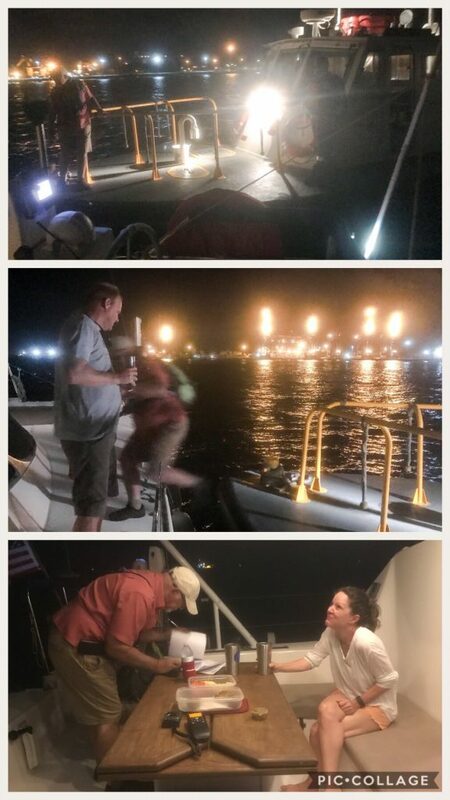 IMAGE: Top shows pilot boat rafting up to us to drop off pilot; Middle shows Michael greeting Francisco; Bottom shows Heather offering a breakfast snack to our pilot. Our pilot, Francisco arrives on board. Heather, Michael and I enjoying the early morning. Sugar Shack passed under the new bridge being built. The sunrise coupled with the lights make this a stunning photo. New bridge under construction at channel entrance. “Uno Mas” caught up to us so we could raft up to them for the first three locks. IMAGE” Top is “Uno Mas” approaching Sugar Shack w/ Skip, Tracy and Stacy at the bow, Angie at adjusting the fender, Mark at the helm and on our boat Francisco assisting Matt with raft up; Middle: “Uno Mas” crew, Right shows how the blue lines are tied through two cleats, and bottom shows the 2-3′ loop that we had to make. As we approached the first chamber, we steered toward starboard (the right side of the chamber) so that “Una Mas” could pick up their first lines. 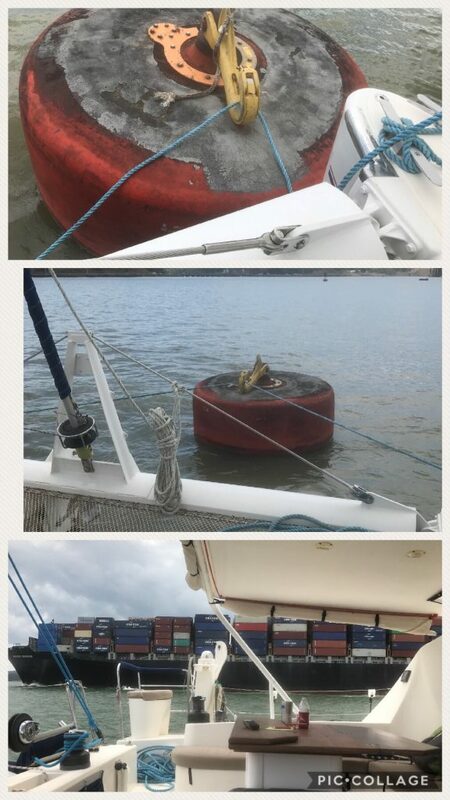 Panama line handlers toss two monkey fists (balls loaded with a lead shot) toward the boat. 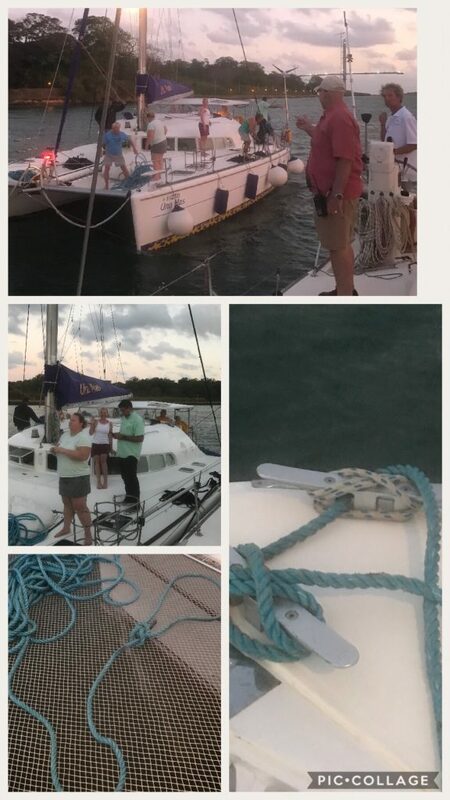 Then the line handlers on “Una Mas” take that monkey fist, put it through the loop in the rented blue line (2-3’ loops were pre-made when the rented blue lines were attached to the boat). Once, the monkey fist goes through the loop, it is then tied back to itself with another bowline knot. Once the bow and stern lines are attached to the starboard side, our two boats moved toward the port side (mainland) where Sugar Shack catches its monkey fists and repeats the process for our bow and stern lines. So, now Sugar Shack has a blue line (up to 2 Panama line handlers) on the port bow and stern and “Una Mas” has a blue line (up to 2 Panama line handlers) on the starboard bow and stern. From here, the Panama line handlers slowly walk our two nested boats into the first lock where we will be center chambered. Once in place, the Panama line handlers pull the monkey fist lines, which are attached to our blue lines. The blue lines are then secured to giant cleats at the top of the canal. 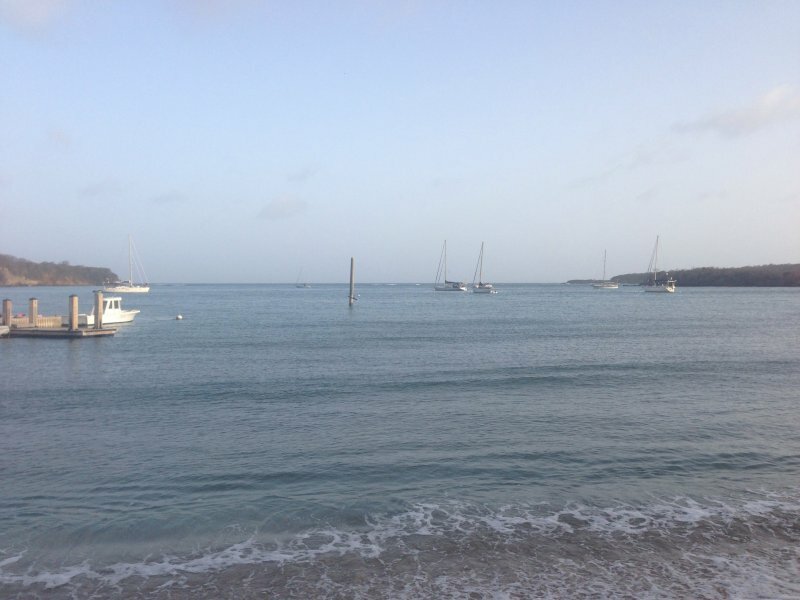 Our two boats were behind a power boat called “Mi Panga” which was behind a large tanker. It looks like these are our transit partners through all 6 locks. 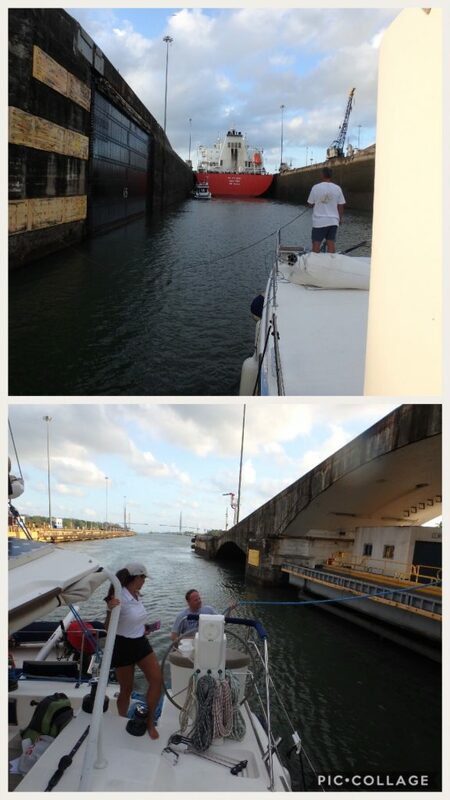 IMAGE: Top entering 1st lock with “Mi Panga” in place behind the orange tanker. Next image are our two Panama Line handlers waiting to toss the monkey fists to us. 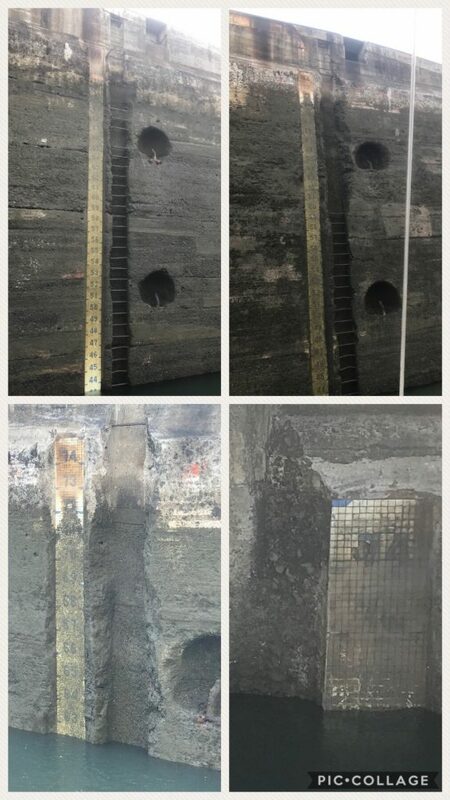 3rd and 4th images are us being walked into place inside the lock. Line handlers at work in first three locks. IMAGE: Top: “Sugar Shack” and “Uno Mas” are center chambered behind “Mi Panga” and a giant cargo ship “SC Taurus” from Hong Kong. The line in Wayne’s hand leads to the Panama line handler at the top of the wall. Bottom shows Michael holding the blue line being walked by another Panama line handler at the top of the same wall. 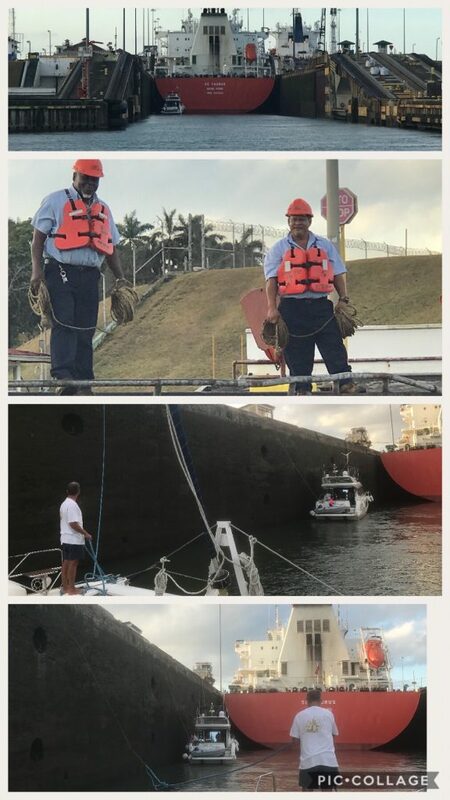 Panama line handlers walking our nested boats to center chamber. As the water fills the chamber, Michael and Wayne on Sugar Shack and 2 teams on “Una Mas” Angie & Tracy and Stacy and Gene, constantly take up slack in the lines to ensure the boats are secured in the center of the chamber. The water started at 45 and rose to 72 in about 10 minutes. With all parties secured, the water starts rushing in at 3 million gallons per minute. They use over 52 million gallons of water to bring boats through all six locks. The boats will rise 3 feet per minute in the first three locks. On the side of the lock, they have measuring indicators to watch as the water rises. The image shows two empty locks (1 and 2), bottom image shows partially filled lock and bottom right shows full lock. Water level indicators on canal wall. After we reached the top, the Panama line handlers toss the big blue lines down to the boats, while holding on to the thin monkey fist line. They then walk the boats down to the second lock where we repeat the process. Pull lines up, cleat, take up slack, close gates, fill chamber, move forward, lock 3. Sugar Shack at the top of the first lock, waiting to be walked to 2nd lock. Osvaldo Traversaro captured a great photo of Sugar Shack and “Uno Mas” going through the locks and posted it on Marine Traffic. These are views from the top of the 2nd and 3rd locks looking back down the canal (where we just came from). 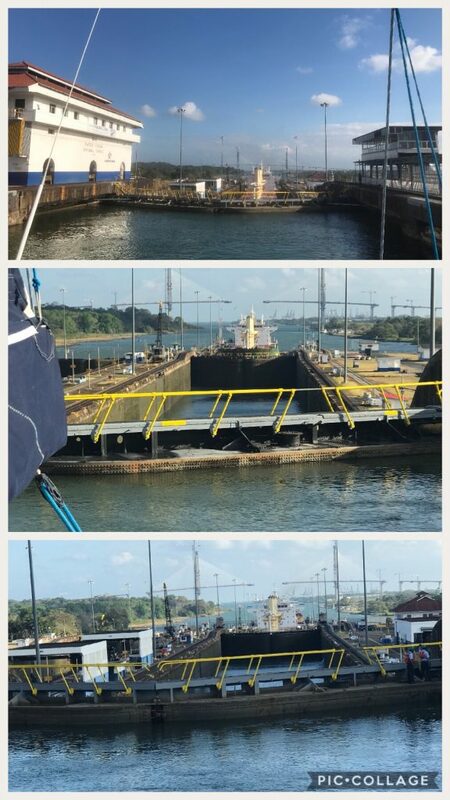 View of the first three locks after being raised to Lake Gatun level. 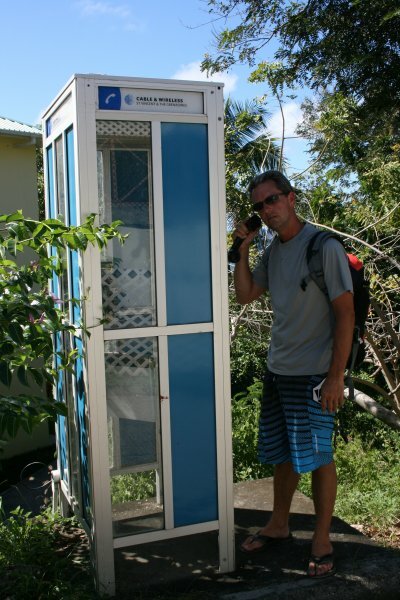 When it was all said and done, we moved up 83’ in elevation before entering Lake Gatun. This was the second time Sugar Shack has been in fresh water. The first time was Rio Chagres and I’d call that brackish water to be honest. We untied “Una Mas” and the two of us started our 20-mile motor to the other side of the lake. It was really calm with no wind, but there were twists and turns as you follow the red markers across the lake. We all took turns at the helm as we motored. Matt finally rested for a few minutes after a stressful morning. Matt resting a bit in between locks. Six miles before the last locks, at Gamboa, we were instructed to pick up a HUGE mooring. A large cargo ship was due to pass us and they needed us out of the way. 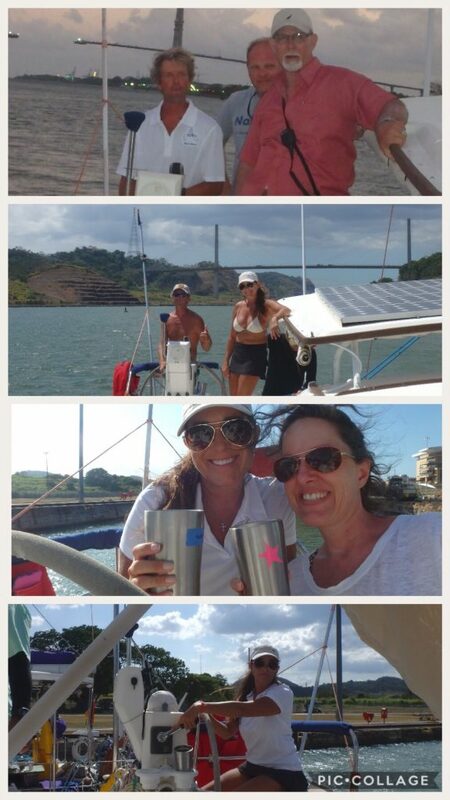 Before the 325’ cargo ship carrying thousands of containers passed us, “Una Mas” rafted up to Sugar Shack on our mooring. Gamboa mooring for a lunch stop. 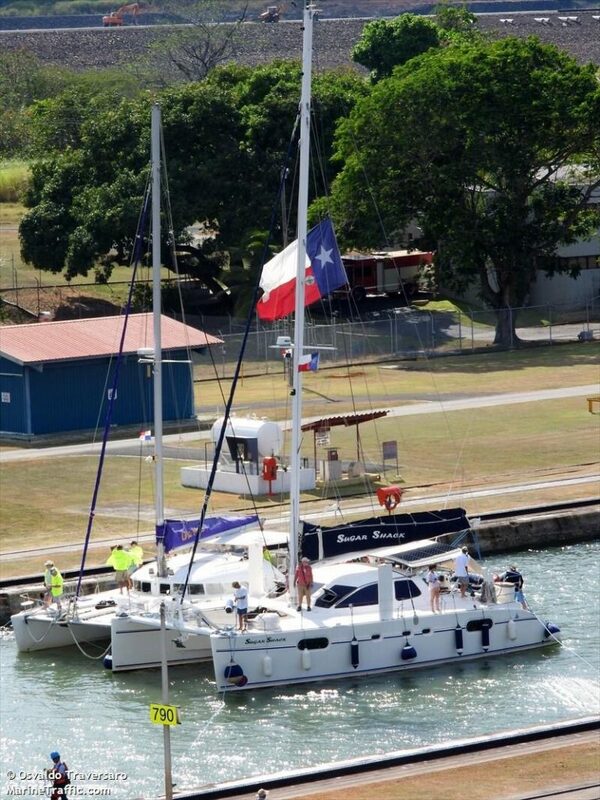 Osvaldo Traversaro captured us at the Gamboa mooring and posted it on Marine Traffic for us. Super cool of him, wish I could thank him. 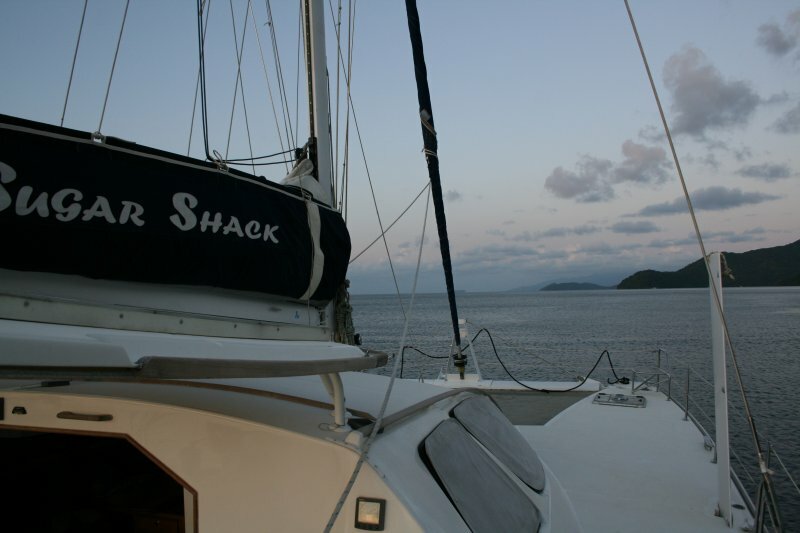 Sugar Shack at Gamboa mooring. 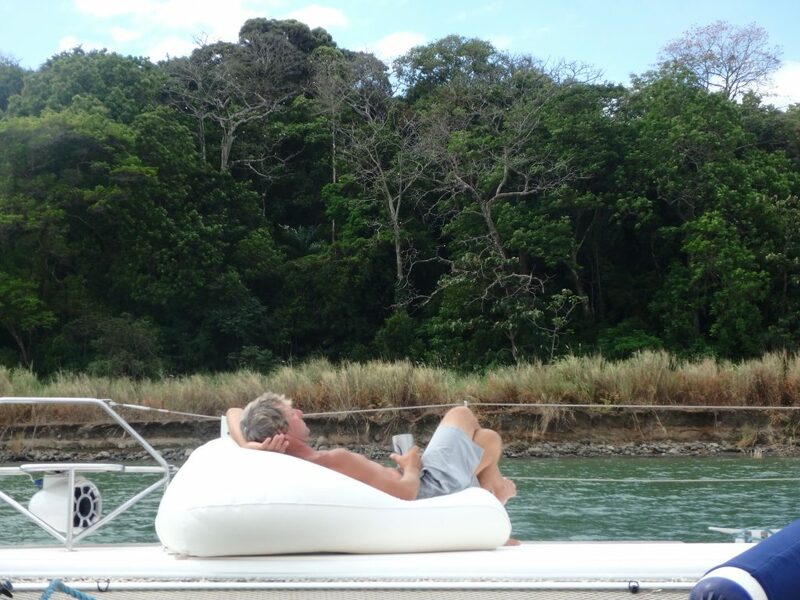 To be continued – please stay tuned for Transiting the Panama Canal on Sugar Shack Part II. Coming Soon. Check out the time lapse video Matt put together at youtube.com/svSugarShack. Stacy captured these stunning shots of Sugar Shack as we were heading to the first lock just at sunrise. So pretty, thank you Stacy! Sugar Shack on the move towards the first lock. 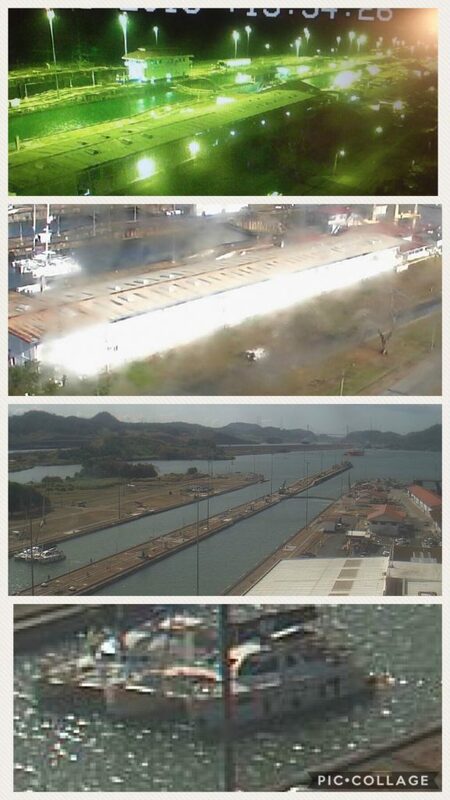 Our good friend Josh, captured these live web cam shots during our Panama Canal transit (thank you Josh!) 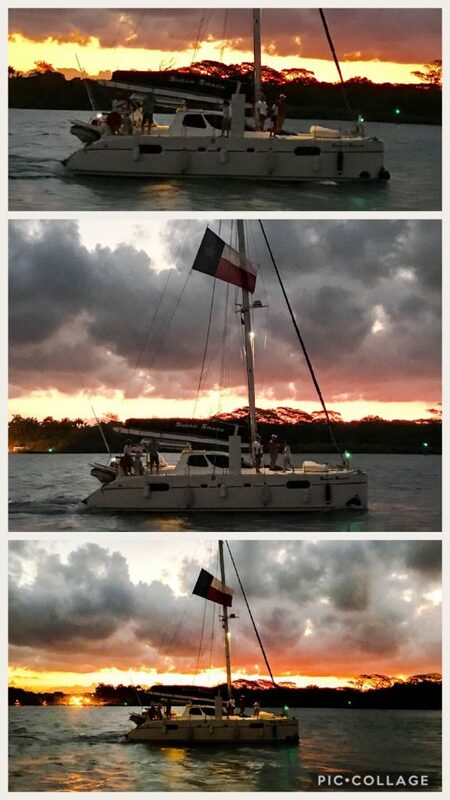 First image is us entering the first locks (early), 2nd image is us leaving first locks (see far left side); third image we are entering into the 5th lock and the bottom image is Matt on our Bimini waiving. Most compelling evidence that we are all having a great time: Matt has his arms spread wide on the starboard bow (does anyone know that song? ), and Heather and Michael enjoying some lovin. Wayne keeping a watchful eye out. Sugar Shack crew enjoying the transit. Surprisingly, the locks are pretty long and each boat has to be hand walked into place. 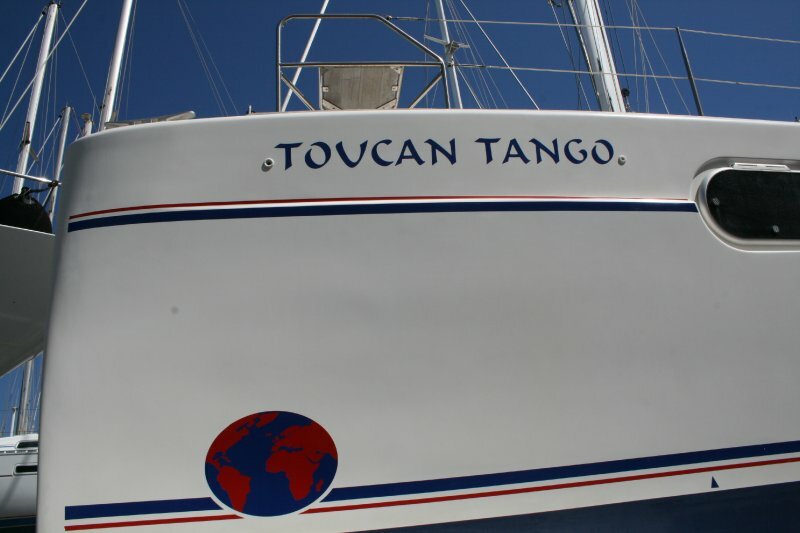 This entry was posted in Panama Canal Transit and tagged catamaran, catana, eric galvez, erick galves, line handlers, monkey fist, Osvaldo Traversaro, panama, panama agent, panama canal, panama transit, sailing, shelter bay marina, ship id, sugar shack, transiting the panama canal on April 28, 2018 by Christine. For simplicity, I will be talking about transiting the Panama Canal from the Atlantic to the Pacific. Boats start this adventure by staging at “the Flats” or “F” anchorage which is outside of Colon Town. Once at the staging area, you wait to be boarded by a designated advisor or pilot who stays with the boat through the first set of locks. Southbound transits usually have a start time of 1600. 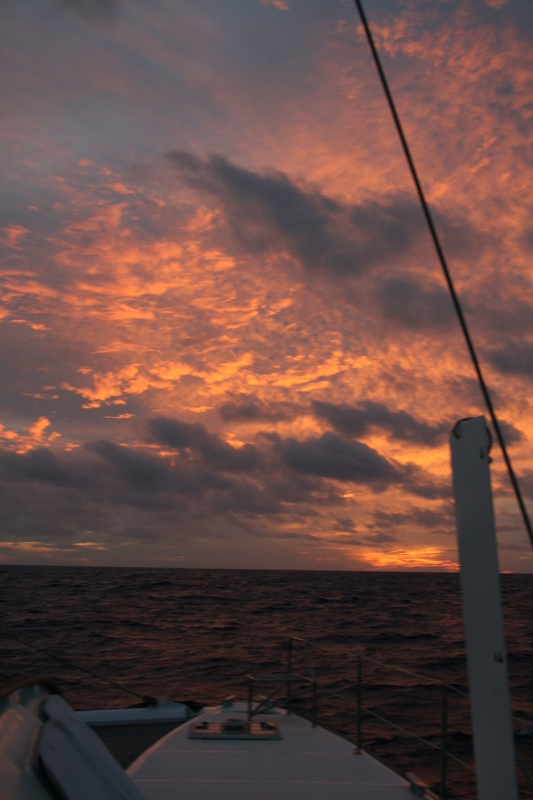 (Of course, you’ll soon read, we transited at 0500 and did this passage in one day.) 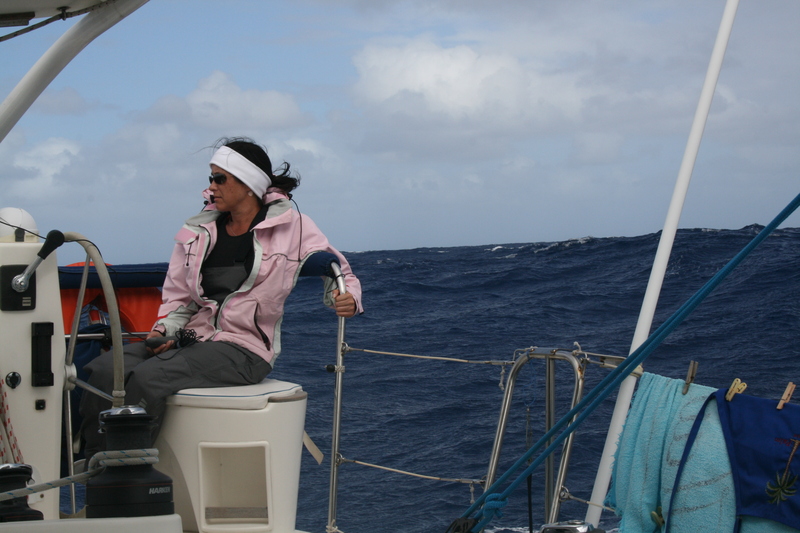 Start times are an estimate of when an advisor will arrive and board your vessel. 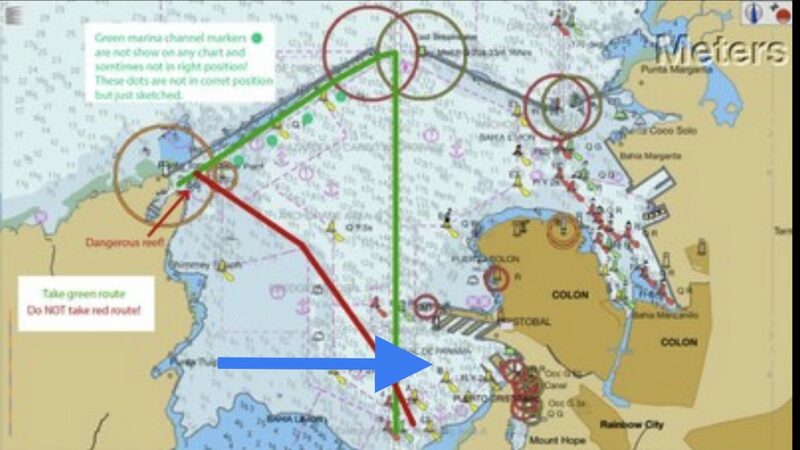 The blue arrow on the image below points to the “Flats” anchorage. The six set of locks, were the world’s largest concrete structures for a long time. In addition, they have functioned flawlessly for over 100 years. The first set are called the Gatun Locks which are physically connected to each other. Here, the vessel is raised a total of 26 meters in three different chambers. Each chamber is 33.5 meters wide and 304 meters long. Each chamber fills at a rate of 3 million gallons per minute and it takes 52 million gallons to move a vessel through all 6 chambers. Approximately 35-40 vessels transit the old Panama Canal Locks and between 7-10 Neo Panamax vessels transit the new locks per week. It costs between $600,000-$1,500,000 for the Neo Panamax to transit the new locks. A cruise ship will pay between $600,000-$1,000,000 to transit through the old locks. All depends on the amount of water they displace. The Neo Panamax is 1200′ long with a 106′ beam, and carries over 40,000 containers. It was built specifically for the new Panama locks. This is an image of the Gatun locks. The ship is in the 3rd lock after already being raised in the previous two locks. Animated photo link. The bulk of the excavation took place in the Gaillard Cut which remains, to this day, the area most susceptible to landslides. 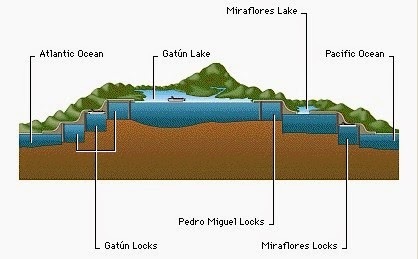 Gaillard Cut connects Gatun Lake to the last three chambers. Once the vessel is through the Gatun Locks, they enter Lake Gatun a man-made lake that extends across the Isthmus. The lake covers an area of 117 square nautical miles and was formed by building the Gatun Dam across the Chagres River. The damn is nearly 800 meters wide at the base but it narrows to 30 meters at the crest. The height of the damn is 32 meters above sea level. Each vessel travels just over 20 miles across Gatun Lake to get to the next set of locks. This is a view of the Gatun dam from the Panama Canal side. As you might recall, we showed a photo of the same dam from the Rio Chagres side a few blogs ago. Pretty cool. On the other side of Gatun Lake are three more chambers. Miguel Lock, is the first one which lowers the vessel 9 meters in one step from the level of Gatun Lake to that of Miraflores Lake. Lake Miraflores is a small artificial body of water that separates the Pacific chambers. The ship is then lowered the remaining two steps to sea level within in the Miraflores locks. This dissension varies greatly due to extreme tidal variations just outside the canal. The Miraflores gates are the tallest in the Panama Canal due to the tides. Photo source. Side view of Panama Canal locks. 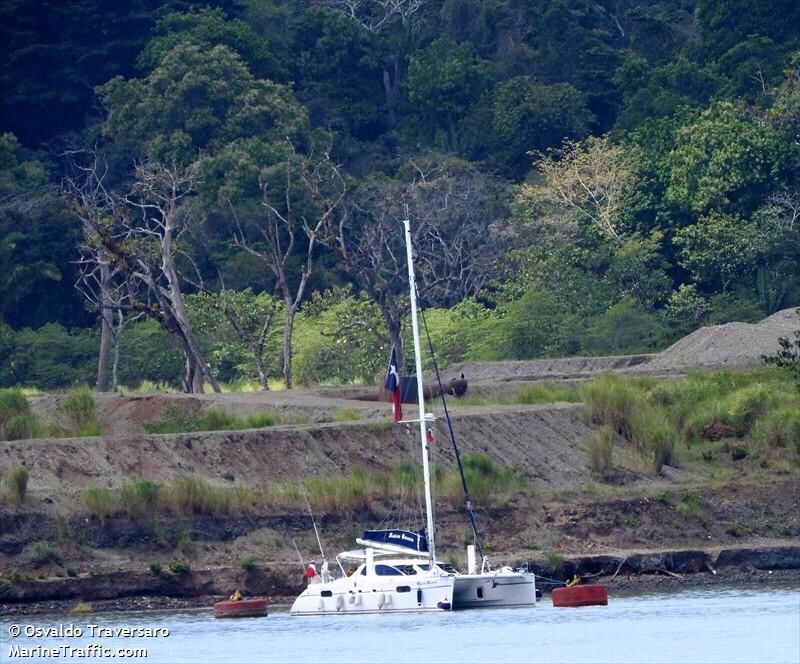 After the pilot boards the vessel in the Flats anchorage, it heads 4 miles south to the Gatun Locks. Typically, cargo ships will proceed ahead of pleasure vessels. (Again you will find our transit had cargo ships in front and behind us.) 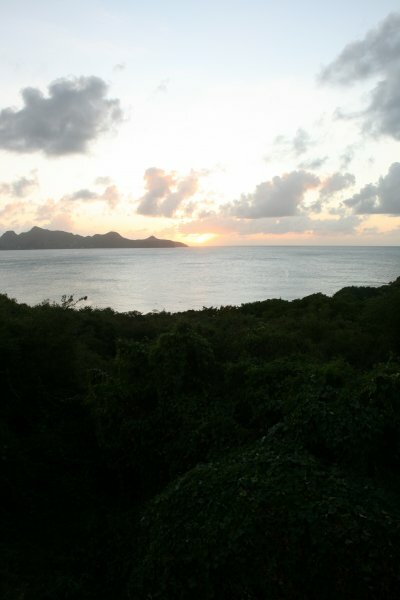 At this time, private yachts will raft or nest together. Most small yachts (under 25 meters) will raft or nest with one to two other vessels. 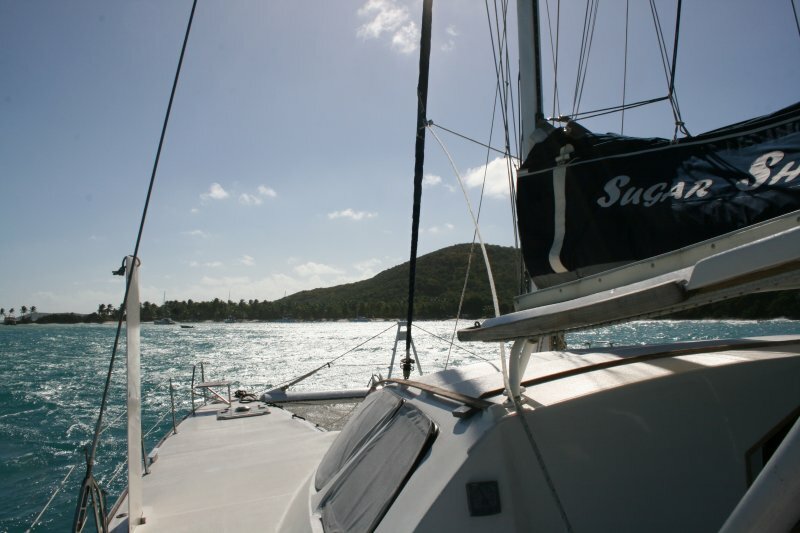 Typically, two monohulls will nest on either side of a catamaran. 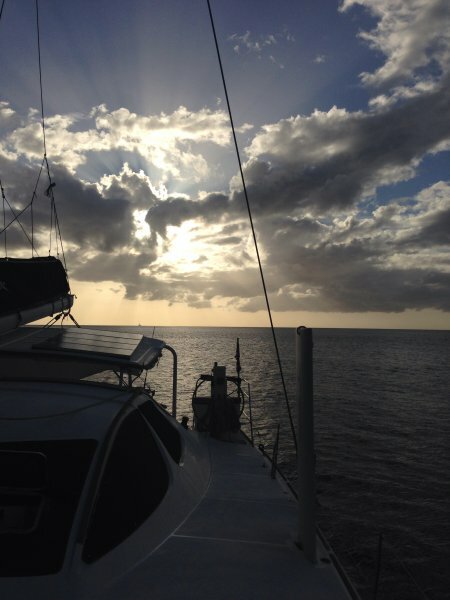 The catamaran then becomes the main source of power and steerage. 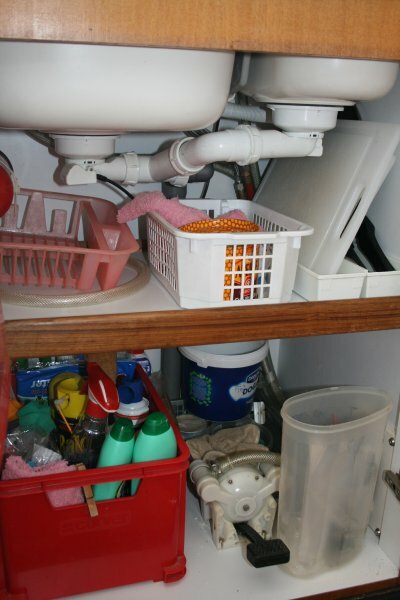 It’s important to realize that all vessels have their engines on at all times to assist in steerage. As the rafted boats enter the first chamber, “monkey fists” are thrown to the boat from the center wall and then from the mainland. 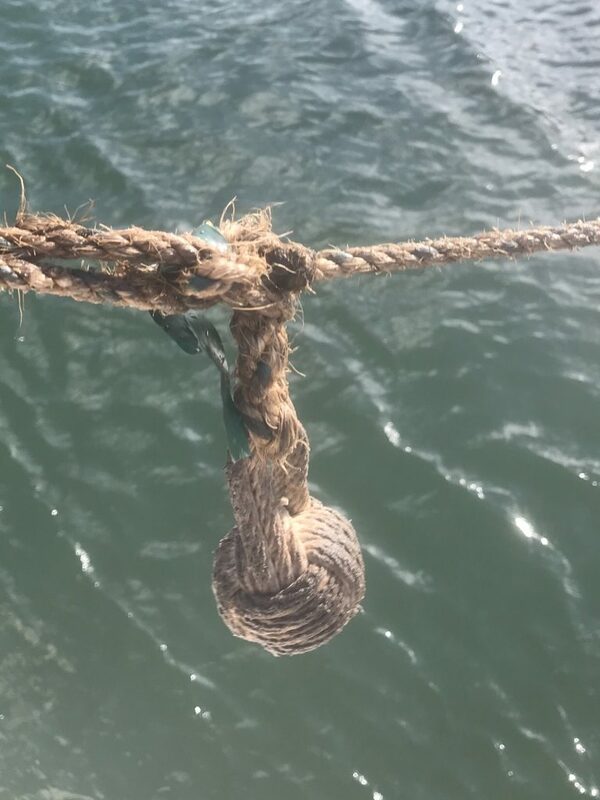 These monkey fists are attached to 125′ lines with a bowline knot that are attached to the boats. We thought the monkey fists would be much bigger, like the size of cantaloupes not the size of golf balls. Upon exiting the Gatun Locks, the vessels are separated as they travel 20 miles to Gamboa where everyone will find a mooring for the night. 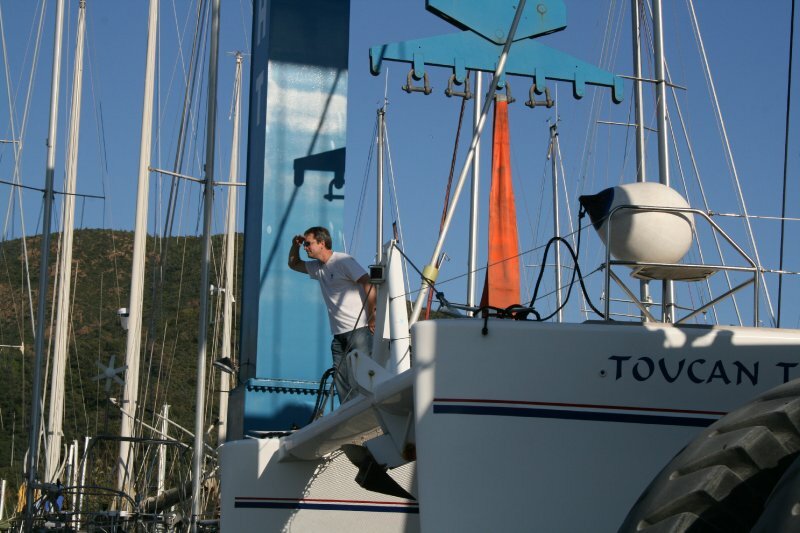 In addition, the pilot will leave the boat and the next morning a new pilot will board. The yachts nest together again for the last three chambers. The same process is repeated twice on the Pacific locks – as the first lock is not connected to the last two locks. Each vessel will separate and head toward the Balboa Yacht Club where the pilot will disembark and agents will retrieve their fenders and lines. And the celebration begins…. Here is a sneak peek at one of our transit photos. 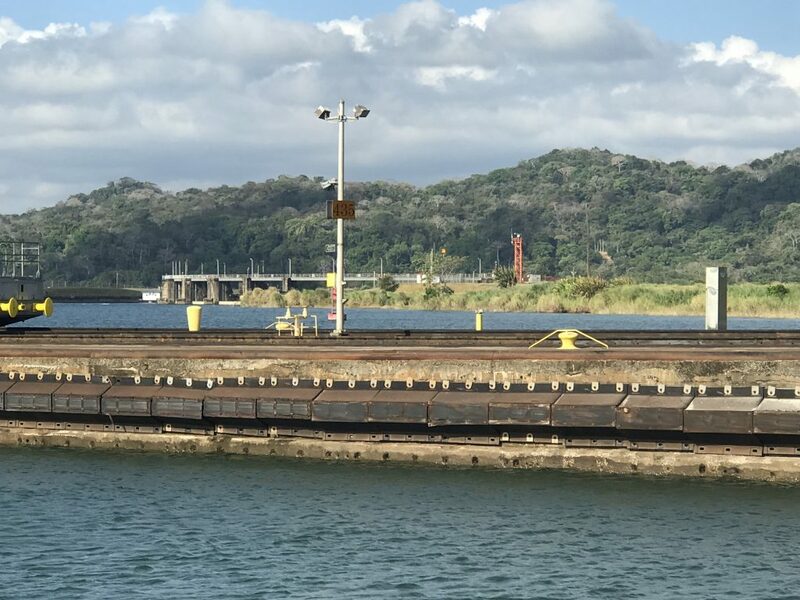 Additionally, if you check back with us you will find several more posts on the Panama Canal. Evidently, the typical process does not apply to our transit at all. But, without a doubt the best experience we’ve had in a long time. Sugar Shack being walked into the first lock. 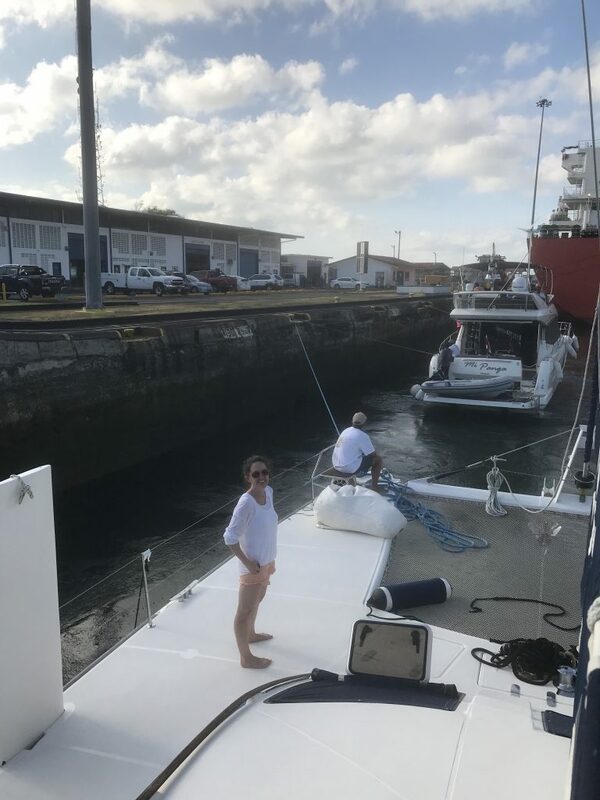 This entry was posted in Panama Canal Transit and tagged cruising, dam, Gailard Cut, Gamboa, Gatun locks, lake gatun, living on a boat, living the dream, miraflores, miraflores locks, monkey fish, panama, panama canal, panama canal transit, sailing, sugar shack, transit on April 26, 2018 by Christine. A brief history on the Panama Canal. 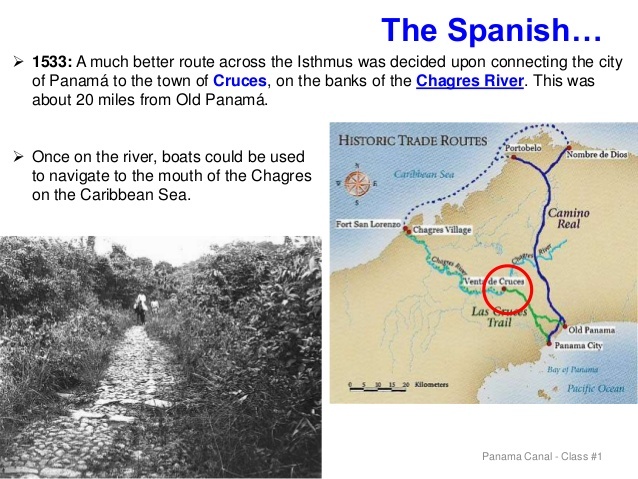 In the 1500’s, King Charles V of Spain studied the feasibility of a canal through the isthmus of Panama. However, they were unable to create anything substantial with picks and shovels. So, they settled with a cobblestone trail over which tons of gold was transported. This trail can still be seen today. Image author. Panama Canal trail and map. 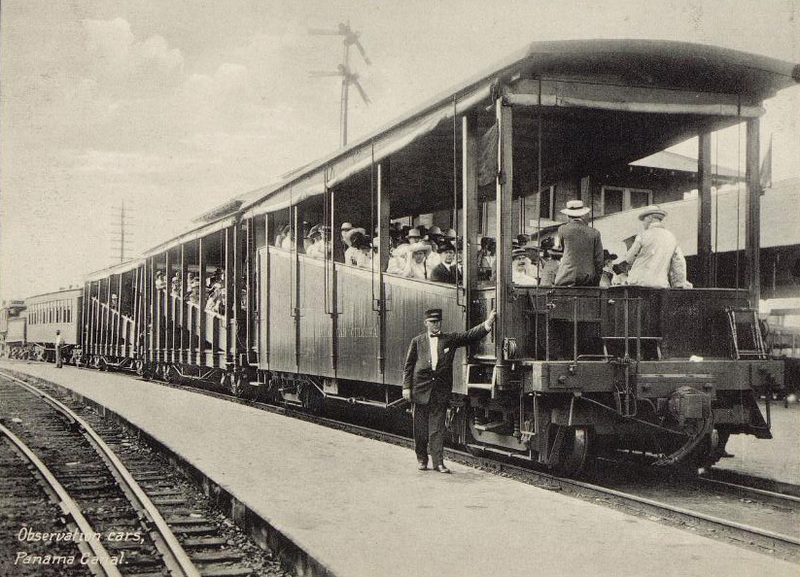 Construction begun on the Panama Railway in 1850 which then opened 5 years later. However, that was only after many hardships, including 10,000 casualties. Once opened, the canal was a huge success with over 400,000 people crossing the Isthmus in the first 11 years. In 1879, Count Ferdinand de Lesseps created the Compagnie Universelle du Canal Interoceanique Panama. 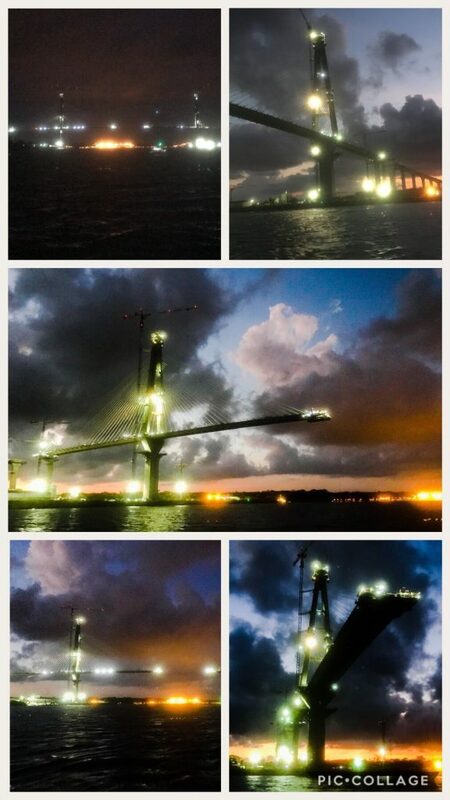 Columbia granted the exclusive privilege to construct the waterway across the Isthmus of Panama. This was to be a 99 year agreement. 8% for the final years. And they added another clause, that no payment was to be less than $250,000 which was what the Panama Railway was earning. In exchange for all of the above payments, Columbia would concede 1,235,000 acres of land, plus 200 meters of land on either side. At the end of the 99 years, Columbia would own all of the equipment, land, and the canal. Unfortunately, the incredible skill of the french engineers could not overcompensate for the many struggles. This project incurred rough terrain, disease, and hardships. Sadly, the company was in financial ruin by 1889. This was after they spent over $285 million and lost over 20,000 lives. In 1894, a second french company, the Compagnie Nouvelle du Canal de Panama emerged to continue the work. However, they were unable to obtain funding and were forced to sell the equipment and rights to the United States. Columbia wanted to raise the fees which President Roosevelt felt were already too high. The two countries hit the negotiation tables. Panama wanted to ceseed from Columbia and President Roosevelt supported the change. In exchange, the U.S. receive the rights to build the canal. The project was completed under budget and ahead of schedule, opening on August 15, 1914. About $100 million was been spent annually to ensure it remains fully operational. From 1979-1999 the canal operated in accordance to the treaty between the Republic of Panama and the U.S. The transfer to the Republic of Panama occurred December 1999. The Panama Canal Commission now manages everything, which is composed of 5 U.S. citizens and 4 Panamanians. 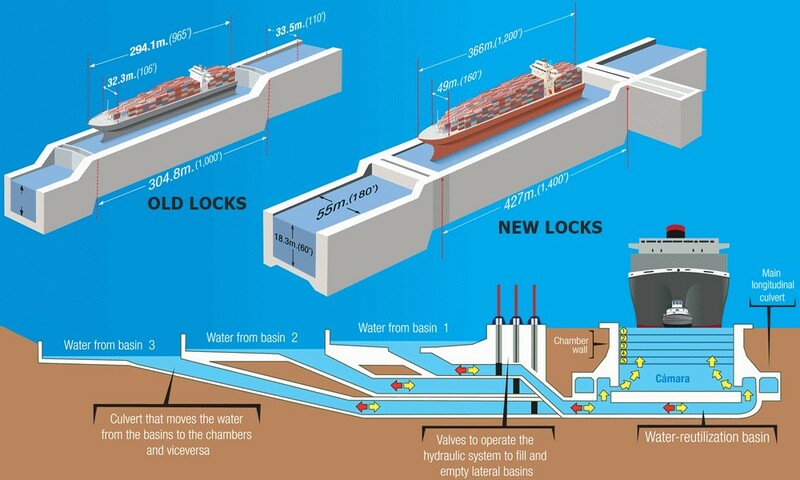 In 2007, construction began on two new sets of locks that added a new lane of traffic for large ships called Panamax. At cost of over $5 billion the new lane opened in June 2016 to the traffic of these giant ships. Compare old and new locks. Photo courtesy of Cruisemapper.com. 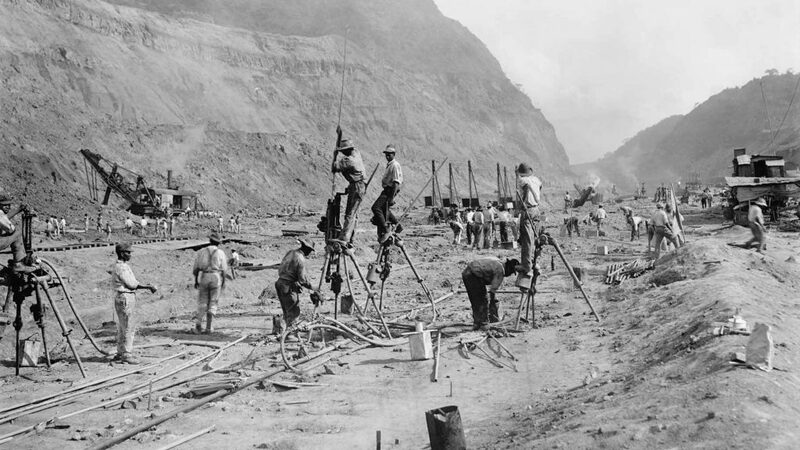 If you want the United States version of this project visit the History of the Panama Canal. 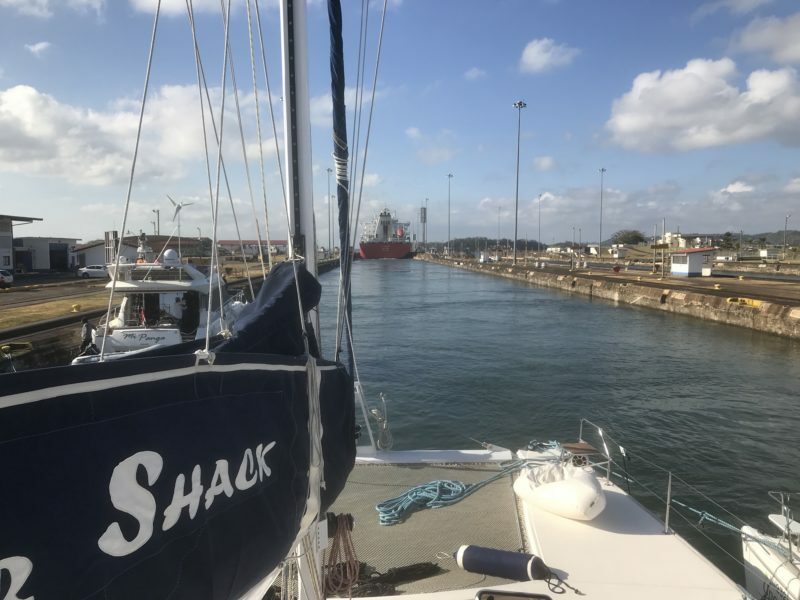 This entry was posted in Panama Canal Transit and tagged columbia, cruising, history of panama canal, isthmus, living on a boat, living the dream, panama, panama canal, panama transit, panamax, sailing, sugar shack on April 24, 2018 by Christine.